In this day in age, the internet, IT, and properly functioning technology is undeniably important to the success of a business. When your South Florida organization works with Askchip.com, you will have a professional and affordable IT and network services company committed to ensuring your staff receives the highest quality computer and network support. Our goal at AskChip is to help you meet and exceed your own business goals. We’ll make things easier for you by handling any IT hurdles you may encounter, allowing you to focus on your daily operations and what’s important to you. You will have a team of highly skilled computer networking experts who works hard to provide your South Florida organization with simple, effective IT solutions to meet your goals and objectives without breaking the bank. 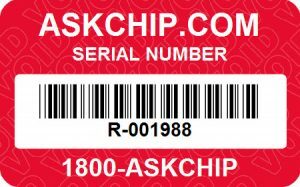 Any technical support and services you may require, AskChip will provide the solutions! * Only available if all users in the workplace are included in the plan. ** Additional, billable charges are applicable. What is the email configuration and maintenance? * Note: This does not include email marketing or mass email lists. It solely refers to the setup and management of user accounts. What is not covered under support? How do I request support or repair? Your serial number is located on a sticker that is normally on the top of the system or on the side. Monitors will have the sticker on the lower back-side corner.